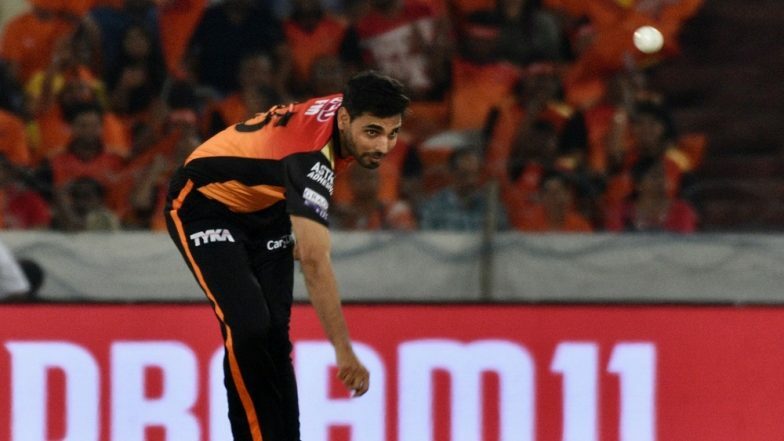 Hyderabad, April 7: Sunrisers Hyderabad failed to apply themselves on the field as well as with the bat, feels stand-in skipper Bhuvneshwar Kumar after they lost to Mumbai Indians by 40 runs here. Mumbai were off to a slow start after being asked to bat first. But Pollard's 26-ball unbeaten 46 helped the three-time champions post a modest 136/7. It was then Alzarri Joseph's sensational six-wicket haul -- the best figures in IPL history -- that helped Rohit Sharma and Co. skittle Sunrisers out for just 96. "It could have been an easy chase if we would have applied ourselves," Bhuvneshwar said post the match on Saturday night. Pollard's innings was helped by a dropped catch, which had a great impact on Mumbai's total and then on the result. Pollard was dropped in the 17th over when the score was 92/6. "I think it started off when we dropped Pollard, he scored 25-30 runs - it is a huge margin," Bhuvneshwar admitted. SRH vs MI Head-to-Head Record: Ahead of IPL 2019 Clash, Here Are Match Results of Last 5 Sunrisers Hyderabad vs Mumbai Indians Encounters! "When you drop catches it is never easy. There is less margin for error (when you are bowling) but you need to grab your chances to restrict any team to under 120," the India pacer said. Bhuvneshwar is captaining the side in place of injured Kane Williamson. Asked about his new role, the 29-year old said: "It (captaincy) is difficult but you have experienced players around, not a tough job." Sunrisers batting collapsed after the deadly opening pair of David Warner and Jonny Bairstow got out. "First three matches we got good opening partnerships but we never got a chance to test our middle order," Bhuvneshwar said. "Today when we did and we did not apply ourselves. We will see what went wrong before going into the next match. It was not a normal flat wicket that we get in Hyderabad but it was not a tough chase," he concluded.